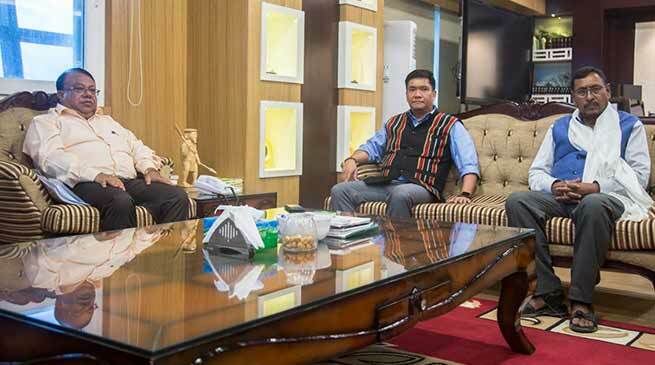 Union Minister of State for Railways Rajen Gohain along with a team of Northeastern Frontier Railways (NFR) officials headed by the General Manager called on Chief Minister Pema Khandu here this afternoon to review the status of ongoing railway projects in Arunachal Pradesh. The NFR officials informed that survey on eleven new railway lines are under progress while two other surveys have been completed. The lines under survey are Bhalukpong-Tawang, Silapathar-Bame-Aalo, Pasighat-Tezu-Parashuramkund-Rupai, Itakhola-Seijosa, Dumduma-Namsai-Wakro, Dangri-Roing, Deomali-Naharkatia, Lekhapani-Kharsang-Miao-Nampong-New Kamlang-Deban and Tinsukia-Pasighat via Simalguri-Kanubari. Of these the first three railway lines are identified by the National Security Council Secretariat and are being funded by the Defense Ministry. Surveys for the Margherita-Deomali (31 Km) and Lekhapani-Kharsang (25 Km) railway lines have been completed. The NFR has set December 2019 as the target to complete surveys for rest of the lines. The officials informed that NFR is taking up the Bhalukpong-Tenga-Tawang railway line on priority due to its strategic importance. The new railway line, once completed, would shorten the travel time to Tawang. While the existing road distance from Bhalukpong to Tawang is 285 Kms, the railway line will be only 166 Kms of which 80% section would be in tunnels, the longest being 29.48 Kms. The Railways have also proposed two-lane roads along all the tunnels to be built on the line, which will shorten the road distance drastically. Khandu appreciated NFR for the rapid progress made in survey of the most difficult railway track in Arunachal Pradesh. Expressing gratitude to Gohain and the Railway Ministry, he asserted that the railway track to Tawang will become the pride of not only the Indian Railways but the entire country. Assuring support of the Ministry Gohain said once the survey is completed and all formalities cleared, the Tawang line should be ready in 6-7 years. He requested the state government to facilitate land for establishment of a camp office of the NFR in Tawang. The NFR is also concentrating on connecting Aalo with Silapathar via Bame in the first phase, which was earlier proposed to further connect Daporijo-Ziro in a loop. It has now proposed for standalone connectivity to Ziro and Daporijo in the second phase. Meanwhile, on the suggestion of Chief Secretary Satya Gopal, also present in the meeting, Gohain assured to look into the complaints of poor condition of the coaches of the Donyi-Polo Express and its time of departure from Naharlagun. In fact, he directed his officials over phone to immediately look into the complaints and rectify them.